In population genetics studies, one is often interested in characterizing structure, genetic differentiation, and relatedness among individuals. Two quantities often considered in this context are FST and kinship. FST is a parameter that measures structure in a subdivided population, satisfying FST = 0 for an unstructured population and FST = 1 if every SNP has fixated in every subpopulation. More specifically, FST is the probability that alleles drawn randomly from a subpopulation are “identical by descent” (IBD) relative to an ancestral population [1, 2]. The kinship coefficient is a measure of relatedness between individuals defined in terms of IBD probabilities, and it is closely related to FST . The most frequently used FST estimators are derived and justified under the “island model” assumption, in which subpopulations are non-overlapping and have evolved independently from a common ancestral population. 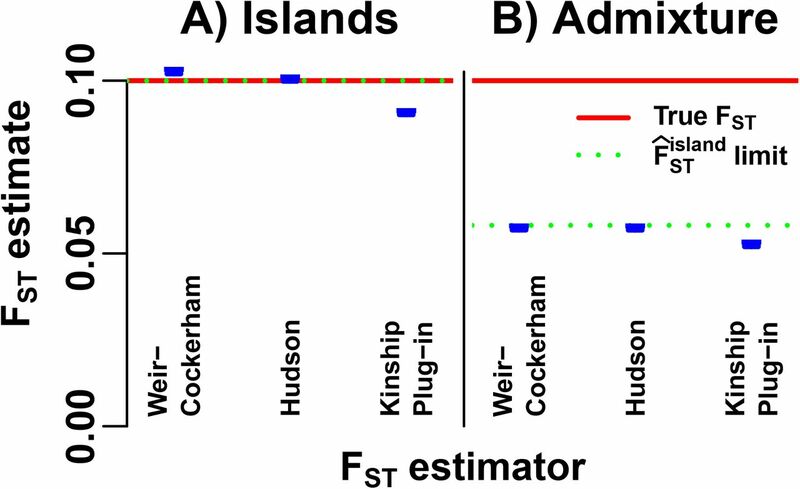 The Weir-Cockerham (WC) FST estimator assumes islands of differing sample sizes and equal FST per island . The “Hudson” FST estimator assumes two islands with different FST values . These FST estimators are ratio estimators derived using the method of moments to have unbiased numerators and denominators, which gives approximately unbiased ratio estimates [3–5], and they are important contributions used widely in the field. Kinship coefficients are now commonly calculated in population genetics studies to capture structure and relatedness. They are utilized in principal components analyses and linear-mixed effects models to correct for structure in Genome-Wide Association Studies (GWAS) and to estimate genome-wide heritability [6–15]. The most commonly used kinship estimator for genotype data [9, 10, 13–18] is also a method of moments estimator whose operating characteristics are largely unknown in the presence of structure. As we show here, the required assumption for this popular estimator to be accurate is that the average kinship be zero, which implies that the population must be unstructured. Recent genome-wide studies have revealed that humans and other natural populations are structured in a complex manner that violate the assumptions of the above estimators. This has been observed in several large human studies, such as the Human Genome Diversity Project , the 1000 Genomes Project , and other contemporary [21, 22] and archaic populations [23, 24]. Therefore, there is a need for innovative approaches designed for complex population structures. To this end, we reveal the operating characteristics of these frequently used FST and kinship estimators in the presence of arbitrary forms of structure with the goal of identifying new estimation strategies for FST and kinship. We generalized the definition of FST for arbitrary population structures in the first paper in this series . Additionally, we derived connections between FST and three models: arbitrary kinship coefficients [1, 26], individual-specific allele frequencies [27, 28], and admixture models [29–31]. Here, we study existing FST and kinship method of moments estimators in models that allow for arbitrary population structures (see Fig. 1 for an overview of the results). First, we obtain new strong convergence results for a family of ratio estimators that includes FST and kinship estimators. Next, we calculate the convergence values of these estimators under arbitrary population structures, where we find biases that are not present under their original assumptions about structure. We characterize the limit of the standard kinship estimator for the first time, identifying complex biases or distortions that have not been described before. 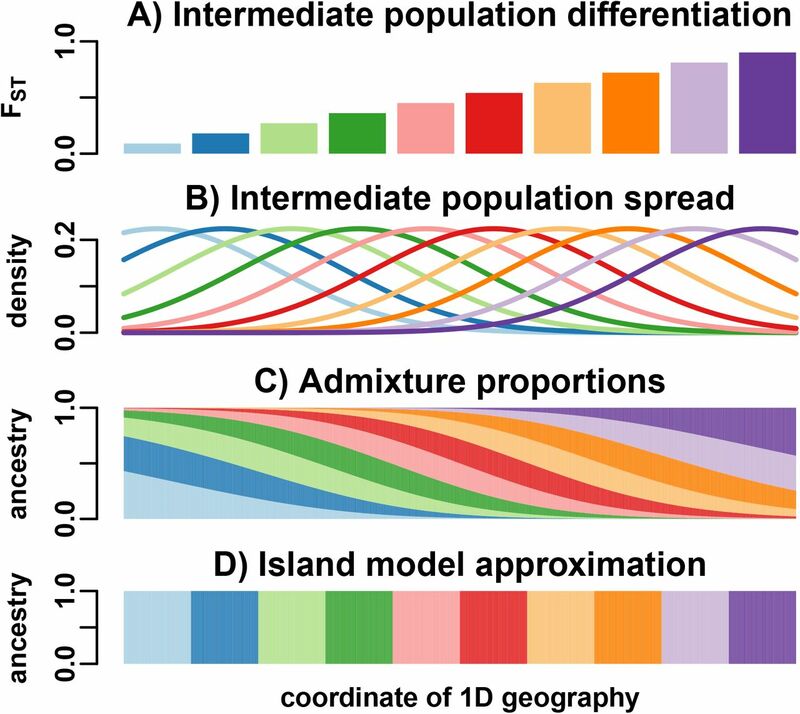 We construct an admixture model, which represents a form of structure distinct from the island model, to illustrate our theoretical findings through simulation. We analyze 1000 Genomes Project populations to illustrate their non-island nature, and measure differentiation that is missed by the Hudson FST estimator. We identify a new direction for estimating FST and kinship in a nearly unbiased fashion, which is the topic of our next paper in this series . 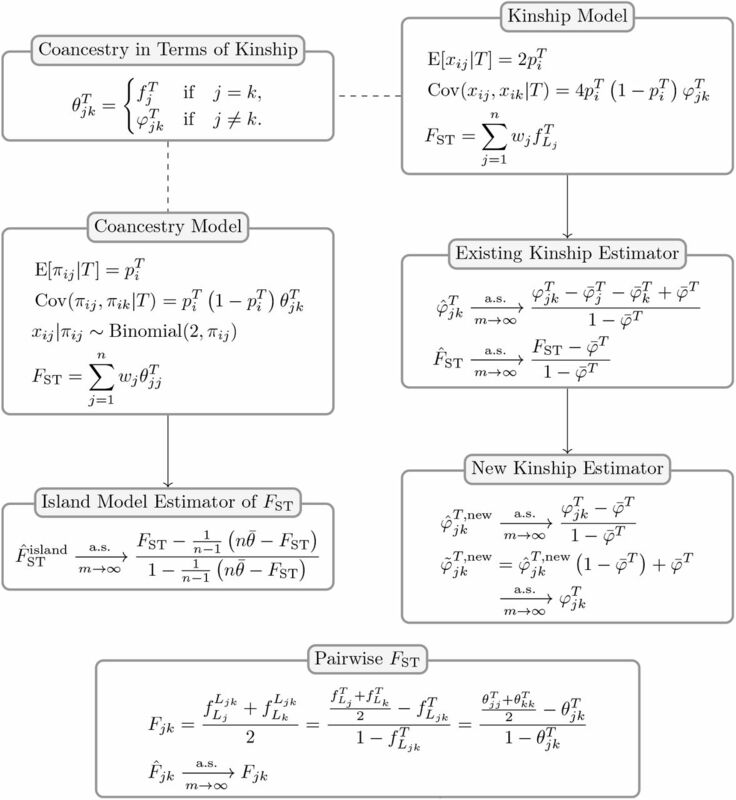 Figure 1: Accuracy of FST and kinship estimators: overview of models and results. that is unbiased for the true pairwise FST that we introduced in our previous work. Note that estimation of FST and Fjk from genotypes requires individuals to be locally outbred and locally unrelated. ∈ (0, 1) for every SNP i.
shared by all individuals j in S relative to T, and equals Wright’s FST for this subdivided population . where the second equality holds for any T ancestral to Ljk . Many FST and kinship coefficient method of moments estimators are “ratio estimators”, a class that tends to be biased and have no closed form expectation . In the literature, the expectation of a ratio is frequently approximated with a ratio of expectations [3–5]. Specifically, estimators are often called “unbiased” if the ratio of expectations is unbiased, even though the ration estimator itself may be biased. Here we characterize the behavior of two ratio estimator families calculated from genome-wide data, detailing conditions where this previous approximation is justified and providing additional criteria to assess the accuracy of such estimators. (Appendix A.2), just as for standard ratio estimators . Although real SNPs are not independent due to genetic linkage, this estimator will perform well if the effective number of independent SNPs is large. Here we study the Weir-Cockerham (WC)  and “Hudson”  FST estimators, which assume the island model. These method of moment estimators have small sample size corrections that remarkably make them consistent as the number of independent SNPs m goes to infinity for finite numbers of individuals. However, these small sample corrections also make the estimators more notationally cumbersome than needed here. In order to illustrate clearly how these estimators behave, both under the island model and arbitrary structure, here we construct simplified versions that assume infinite sample sizes per population. This simplification corresponds to eliminating statistical sampling, leaving only genetic sampling to analyze . Note that our simplified estimator nevertheless illustrates the general behavior of the WC and Hudson estimators under arbitrary structure, and the results are equivalent to those we would obtain under finite sample sizes of indivduals. , under our coancestry model defined in Eqs. (6) – (8). and solving for FST in this system of equations recovers the estimator of Eq. (14). precludes consistent FST estimation without additional assumptions. is the average of all between-individual coancestry coefficients, a term that appears in a related result for populations . Therefore, under arbitrary structure the island model estimator’s bias is due to the coancestry between individuals (or islands in the traditional, non-overlapping subpopulation setting). may arise even if FST is very large. where the limit is stated for general T ≠ Ljk and matches Fjk under the coancestry model . tends to be larger than the corresponding Hudson estimate when Su and Sv are structured. , and find an underdetermined estimation problem, just as for FST. estimators of Eq. (21) are considered rather than only the j = k cases. Therefore, we cannot estimate coancestry coefficients consistently using only the first two moments and without additional assumptions. , and define unbiased FST estimators that require knowing the mean kinship or coancestry, or its proportion relative to FST. Lastly, we present a new kinship method of moments estimator with a uniform bias, which facilitates the estimation of the unknown mean kinship parameter needed to unbias kinship and FST estimates (Fig. 1). which is present in all estimators we have studied. , which causes the bias observed in Eq. (29). are biased, we nevertheless plug them into our definition of FST so that we may study how bias manifests. Note that we do not recommend utilizing these FST estimators in practice, but we find these results informative for identifying how to proceed in deriving new estimators. of Eq. (31) admits arbitrary weights and, by forgoing bias correction under the island model, is a simpler target of study. of Eq. (30) converges to a negative value. which is approximated by s if FST ≪ 1, hence the name “bias coefficient”. Here, we outline a new estimation framework for kinship coefficients that has properties favorable for obtaining nearly unbiased estimates. These new kinship estimates can then also be utilized for FST estimation. We summarize our ideas here and then fully develop the estimation framework and study its operating characteristics in the next paper in this series .
. Our improved kinship estimator will result in a plug-in FST estimator with increased accuracy. of Eq. (26), so the resulting plug-in FST estimator equals that of Eq. (30). Therefore, Eq. (38) by itself does not directly yield a new FST estimator. We simulate genotypes from two models to illustrate our results when the true population structure parameters are known. One is an island model, the other an admixture model differing from the island model by its pervasive covariance, and designed to induce large biases in existing FST estimators (Fig. 2). Both simulations have n = 1000 individuals, m = 300, 000 SNP loci, and K = 10 islands or intermediate populations. These simulations have FST = 0.1, comparable to estimates between human populations . Figure 2: Coancestry matrices of our simulations. per island, resulting in a block-diagonal covariance matrix. B) Our admixture scenario models a 1D geography with extensive admixture and intermediate population differentiation that increases with coordinate. Individuals are ordered by their coordinate in the 1D geography.
. Podpulation sample sizes were drawn randomly (Appendix F). (in contrast, the island simulation has s = 0.1). See Appendix F for additional details regarding these simulations. Figure 3: 1D admixture scenario. We model a 1D geography population that departs strongly from the island model. A) K = 10 intermediate populations, placed equidistant on a line, evolve independently with FST increasing with x-coordinate. B) Once differentiated, these intermediate populations spread by random walks modeled by Normal densities. C) n = 1000 individuals, sampled in equal intervals in the same range, are admixed proportionally to the previous Normal densities. D) To apply the WC and Hudson FST estimators, individuals are assigned to populations (“islands”) by their majority ancestry. ; greater bias is expected for smaller K.
Figure 4: Weir-Cockerham and Hudson FST estimators misapplied to our admixture model.
. The estimator limit of Eq. (15) (green dotted line) overlaps the true FST (red dashed line) in (A) but not (B). Estimates (blue) include 95% prediction intervals (too narrow to see) from 39 independently-simulated genotype matrices for each model (Appendix G). also has a large relative bias of about s = 50%; remarkably, the WC and Hudson estimators suffer from comparable biases. Thus, the island model corrections of the WC and Hudson estimators are insufficient for estimating FST in our admixture scenario. (Fig. 2B) and Fjk (Fig. 5A) matrices are negatively correlated. Figure 5: Consistent individual-level pairwise FST estimates. Consistency of our individual-level pairwise FST estimators is demonstrated in our admixture simulation. Plots show n = 1000 individuals along both axes, and color corresponds to Fjk between individuals j and k. A) True pairwise FST matrix. The pairwise FST measures the mean differentiation of each pair of individual from their last common ancestor, and is negatively correlated with coancestry. B) Estimate from IAFs. C) Estimate from genotypes. Both of our consistent Fjk estimators perform well, using IAFs (Eq. (16), Fig. 5B) and genotypes (Eq. (17), Fig. 5C). Estimates from genotypes have a greater root-mean-squared error (RMSE, 3.43% relative to the mean Fjk) than the estimates from true IAFs (RMSE of 0.319%).
. In contrast, mean-of-ratios estimates have an RMSE of 10.77% from the limit of Eq. (24) (not shown). The distortions are similar for the estimator that uses IAFs of Eq. (29) (not shown), with reduced RMSEs from its limit of 0.32% and 8.82% for the ratio-of-means and mean-of-ratios estimates, respectively. Figure 6: Bias in kinship estimates. estimator of Eq. (24) as the number of independent SNPs goes to infinity. that are not known in practice. Figure 7: Evaluation of plug-in and adjusted FST estimators.
. Lines: true FST (red dashed line), limits of biased estimators (green dotted lines, which differ slightly per panel). Estimates (blue) include 95% prediction intervals (too narrow to see) from 39 independently-simulated genotype matrices for our admixture model (Appendix G). Prediction intervals were computed from estimates over 39 independently-simulated IAF and genotype matrices (Appendix G). Estimator limits are always contained in these intervals, which holds since the number of independent SNPs (m = 300, 000) is sufficiently large. 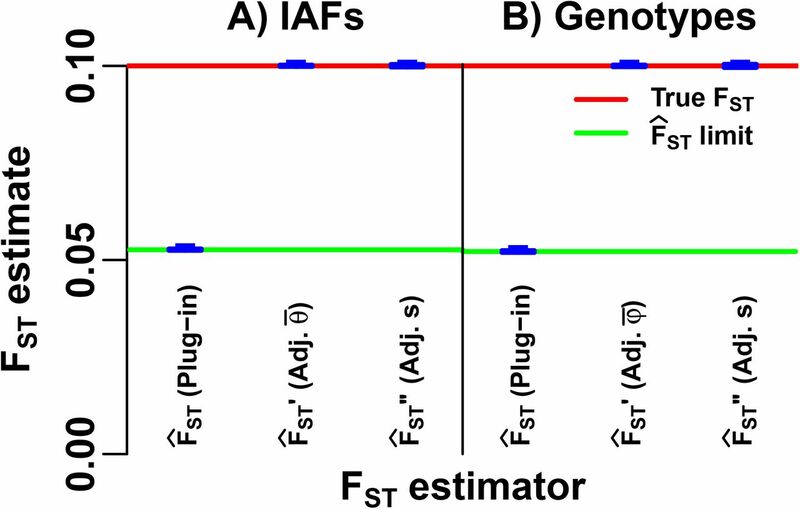 Estimates that use genotypes have wider intervals than estimates from IAFs; however, IAFs are not known in practice, and use of estimated IAFs might increase noise. Genetic linkage, not present in our simulation, will also increase noise in real data. , corroborating a good fit of the island model (Fig. 8D). Figure 8: Comparison of pairwise FST estimates on 1000 Genomes Project populations. (see text) for all pairs of populations. , detects structure that is missed by island model estimators. We investigated the most commonly utilized estimators of FST and kinship, both of which can be derived using the method of moments (Fig. 1). We determined the bias of these estimators under models of arbitrary population structure. We calculated the bias that occurs in the FST estimator when the island model assumption is violated. This bias is present even when individual-specific allele frequencies are known without error. We also showed that the kinship estimator is biased when the population is structured (particularly when the average kinship is of a similar magnitude to the true kinship coefficient), and that the bias may be different for each pair of individuals. Use of island model FST estimators requires taking certain precautions, as exemplified in the Hudson FST estimator work . First, the Hudson estimator is given for two populations only, since two panmictic populations are always independent relative to their last common ancestor population. Second, only geographically distant population pairs were compared , which appear internally unstructured relative to the structure between populations. However, FST is often estimated between closely related populations, for example, within Mexico , the United Kingdom , and between contemporary and archaic European  and Eurasian populations . 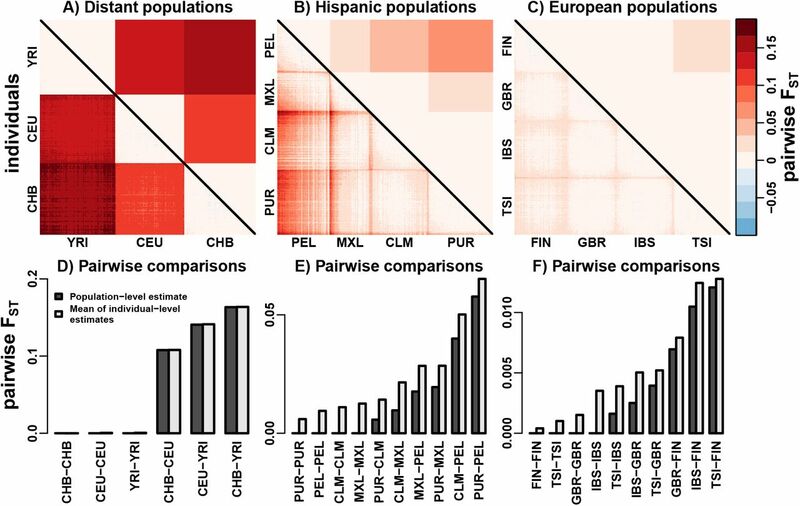 These geographically close populations are more likely to have comparable structure within and between populations, a case where Hudson underestimates differentiation, just as in the Hispanic and European populations in Fig. 8. Our analyses highlight the need for new tools that measure differentiation in complex population structures. We have shown that the misapplication of existing FST estimators on non-island population structures may lead to estimates that approach zero even when the true generalized FST is large. Weir-Cockerham  and Hudson  FST estimates in our admixture simulation are biased by nearly a factor of two (Fig. 4). These estimators were derived assuming independent populations, so the observed biases arise from their misapplication to non-island populations. Nevertheless, natural populations often do not adhere to the island model, particularly human populations [44–46]. The kinship coefficient estimator we investigated is often used to control for population structure in GWAS and to estimate genome-wide heritability [9, 10, 13–18]. While this estimator was known to be biased [10, 18], no closed form limit had been calculated until now. We found that kinship estimates are biased downwardly on average, but bias also varies for every pair of individuals (Fig. 1, Fig. 6). Thus, the use of these distorted kinship estimates may be problematic in GWAS or estimating heritability, but to what extent remains to be determined. We developed a theoretical framework for assessing these genome-wide ratio estimators of FST and kinship. We proved that common ratio-of-means estimators converge almost surely to the ratio of expectations for infinite independent SNPs (Appendix A.1). Our result justifies approximating the expectation of a ratio-of-means estimator with the ratio of expectations [3–5]. However, mean-of-ratios estimators may not converge to the ratio of expectations for infinite SNPs. Mean-of-ratios estimators are potentially asymptotically unbiased for infinite individuals, but it is unclear which estimators have this behavior. We found that the ratio-of-means kinship estimator had much smaller errors from the ratio of expectations than the more common mean-of-ratios estimator, whose convergence value is unknown. Thus, we recommend ratio-of-means estimators, whose asymptotic behavior is well understood. than Fjk parameters. We used our Fjk estimator to identify structure with individual resolution in 1000 Genomes Project populations (Fig. 8). Accurate estimation of generalized FST and kinship coefficients in arbitrary population structures will require further innovations, and the results provided here may be useful in leading to more robust estimators in the future. This, in particular, is the topic we tackle in the next paper in this series . is as for standard ratio estimators . which consistently estimates FST in island models. , with equality for island models by construction. , and which enable us to calculate the limits of our estimators. Below are examples for genotypes, which follow from Eqs. (1) and (2); calculations for IAFs follow analogously from Eqs. (6) and (7) (not shown). from the island model, which Hudson estimates . where FST is the desired value. FST = 0.1 is achieved with τ ≈ 0.901.
, πij, xij drawn anew. G. Malécot. Mathématiques de l’hérédité. Masson et Cie, 1948. S. Wright. “The Genetical Structure of Populations”. Annals of Eugenics 15(1) (1951), pp. 15–354. B. S. Weir and C. C. Cockerham. “Estimating F-Statistics for the Analysis of Population Structure”. Evolution 38(6) (1984), pp. 38–1370. G. Bhatia et al. “Estimating and interpreting FST: The impact of rare variants”. Genome Res. 23(9) (2013), pp. 23–1521. B. S. Weir and W. G. Hill. “Estimating F-Statistics”. Annual Review of Genetics 36(1) (2002), pp. 36–750. C. Xie, D. D. G. Gessler, and S. Xu. “Combining Different Line Crosses for Mapping Quantitative Trait Loci Using the Identical by Descent-Based Variance Component Method”. Genetics 149(2) (1998), pp. 149–1146. J. Yu et al. “A unified mixed-model method for association mapping that accounts for multiple levels of relatedness”. Nat Genet 38(2) (2006), pp. 38–208. Y. S. Aulchenko, D.-J. d. Koning, and C. Haley. “Genomewide Rapid Association Using Mixed Model and Regression: A Fast and Simple Method For Genomewide Pedigree-Based Quantitative Trait Loci Association Analysis”. Genetics 177(1) (2007), pp. 177–585. A. L. Price et al. “Principal components analysis corrects for stratification in genome-wide association studies”. Nat Genet 38(8) (2006), pp. 38–909. W. Astle and D. J. Balding. “Population Structure and Cryptic Relatedness in Genetic Association Studies”. Statist. Sci. 24(4) (2009). Mathematical Reviews number (MathSciNet): MR2779337, pp. 451–471. H. M. Kang et al. “Efficient Control of Population Structure in Model Organism Association Mapping”. Genetics 178(3) (2008), pp. 178–1723. H. M. Kang et al. “Variance component model to account for sample structure in genome-wide association studies”. Nat Genet 42(4) (2010), pp. 42–354. J. Yang et al. “Common SNPs explain a large proportion of the heritability for human height”. Nat Genet 42(7) (2010), pp. 42–569. J. Yang et al. “GCTA: A Tool for Genome-wide Complex Trait Analysis”. The American Journal of Human Genetics 88(1) (2011), pp. 88–82. X. Zhou and M. Stephens. “Genome-wide efficient mixed-model analysis for association studies”. Nat Genet 44(7) (2012), pp. 44–824. C. S. Rakovski and D. O. Stram. “A Kinship-Based Modification of the Armitage Trend Test to Address Hidden Population Structure and Small Differential Genotyping Errors”. PLOS ONE 4(6) (2009), e5825. T. Thornton and M. S. McPeek. “ROADTRIPS: Case-Control Association Testing with Partially or Completely Unknown Population and Pedigree Structure”. The American Journal of Human Genetics 86(2) (2010), pp. 86–184. D. Speed and D. J. Balding. “Relatedness in the post-genomic era: is it still useful?” Nat Rev Genet 16(1) (2015), pp. 16–44. N. A. Rosenberg et al. “Genetic Structure of Human Populations”. Science 298(5602) (2002), pp. 298–2385. T. G. P. Consortium. “A map of human genome variation from population-scale sequencing”. Nature 467(7319) (2010), pp. 467–1073. A. Moreno-Estrada et al. “The genetics of Mexico recapitulates Native American substructure and affects biomedical traits”. Science 344(6189) (2014), pp. 344–1285. S. Leslie et al. “The fine-scale genetic structure of the British population”. Nature 519(7543) (2015), pp. 519–314. W. Haak et al. “Massive migration from the steppe was a source for Indo-European languages in Europe”. Nature 522(7555) (2015), pp. 522–211. M. E. Allentoft et al. “Population genomics of Bronze Age Eurasia”. Nature 522(7555) (2015), pp. 522–172. A. Ochoa and J. D. Storey. “FST and kinship for arbitrary population structures I: Generalized definitions”. Submitted. A. Jacquard. Structures génétiques des populations. Paris: Masson et Cie, 1970. T. Thornton et al. “Estimating Kinship in Admixed Populations”. The American Journal of Human Genetics 91(1) (2012), pp. 91–138. W. Hao, M. Song, and J. D. Storey. “Probabilistic models of genetic variation in structured populations applied to global human studies”. Bioinformatics 32(5) (2016), pp. 32–721. J. K. Pritchard, M. Stephens, and P. Donnelly. “Inference of Population Structure Using Multilocus Genotype Data”. Genetics 155(2) (2000), pp. 155–959. H. Tang et al. “Estimation of individual admixture: Analytical and study design considerations”. Genet. Epidemiol. 28(4) (2005), pp. 28–301. D. H. Alexander, J. Novembre, and K. Lange. “Fast model-based estimation of ancestry in unrelated individuals”. Genome Res. 19(9) (2009), pp. 19–1664. A. Ochoa and J. D. Storey. “FST and kinship for arbitrary population structures III: A new estimation framework”. In preparation. S. Wright. “Systems of Mating. V. General Considerations”. Genetics 6(2) (1921), pp. 6–178. G. Nicholson et al. “Assessing population differentiation and isolation from single-nucleotide polymorphism data”. Journal of the Royal Statistical Society: Series B (Statistical Methodology) 64(4) (2002), pp. 64–715. W. G. Cochran. Sampling techniques. 3rd ed. Wiley, 1977. B. S. Weir. Genetic data analysis II. Methods for discrete population genetic data. Sunderland, USA: Sinauer Associates, 1996. C. Bourgain et al. “Novel Case-Control Test in a Founder Population Identifies P-Selectin as an Atopy-Susceptibility Locus”. The American Journal of Human Genetics 73(3) (2003), pp. 73–626. Y. Choi, E. M. Wijsman, and B. S. Weir. “Case-Control Association Testing in the Presence of Unknown Relationships”. Genet Epidemiol 33(8) (2009), pp. 33–678. J. K. Pickrell and J. K. Pritchard. “Inference of Population Splits and Mixtures from Genome-Wide Allele Frequency Data”. PLoS Genet 8(11) (2012), e1002967. M. Nei. “Analysis of Gene Diversity in Subdivided Populations”. PNAS 70(12) (1973), pp. 70–3323. D. J. Balding and R. A. Nichols. “A method for quantifying differentiation between populations at multi-allelic loci and its implications for investigating identity and paternity”. Genetica 96(1-2) (1995), pp. 3–12. D. Falush, M. Stephens, and J. K. Pritchard. “Inference of Population Structure Using Multi-locus Genotype Data: Linked Loci and Correlated Allele Frequencies”. Genetics 164(4) (2003), pp. 164–1587. A. Raj, M. Stephens, and J. K. Pritchard. “fastSTRUCTURE: Variational Inference of Population Structure in Large SNP Data Sets”. Genetics 197(2) (2014), pp. 197–589. J. Novembre et al. “Genes mirror geography within Europe”. Nature 456(7218) (2008), pp. 456–101. G. Coop et al. “The Role of Geography in Human Adaptation”. PLoS Genet 5(6) (2009), e1000500. N. Patterson et al. “Ancient Admixture in Human History”. Genetics 192(3) (2012), pp. 192–1093. G. Coop et al. “Using Environmental Correlations to Identify Loci Underlying Local Adaptation”. Genetics 185(4) (2010), pp. 185–1423. H. B. Mann and A. Wald. “On Stochastic Limit and Order Relationships”. The Annals of Mathematical Statistics 14(3) (1943), pp. 14–226. P. Billingsley. Convergence of Probability Measures. John Wiley & Sons, 2013. W. Feller. An introduction to probability theory and its applications. 3rd ed. Vol. 1. John Wiley & Sons London-New York-Sydney-Toronto, 1968. H. O. Hartley and A. Ross. “Unbiased Ratio Estimators”. Nature 174(4423) (1954), pp. 174–271. R. Beran and P. Hall. “Interpolated Nonparametric Prediction Intervals and Confidence Intervals”. Journal of the Royal Statistical Society. Series B (Methodological) 55(3) (1993), pp. 55–652.